It was a day when the tight trading of recent days started to widen (in favor of sellers). 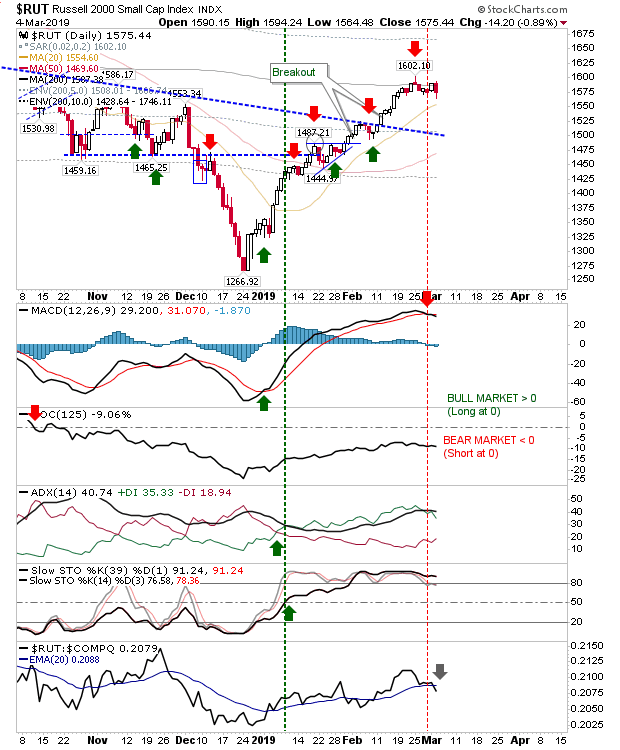 The Russell 2000 reversed Friday's gain as the 200-day MA became a more substantial resistance level. Relative performance against the Nasdaq ticked lower as the index edges towards a new phase of weakness. The marked short trade is still in play with the MACD trigger line acting as a lead indicator to the trade. The S&P did ease back towards support and did spike below declining resistance but recovered by the close. The 20-day MA managed a 'golden cross' against the 200-day MA and its this convergence is helping to play as support. 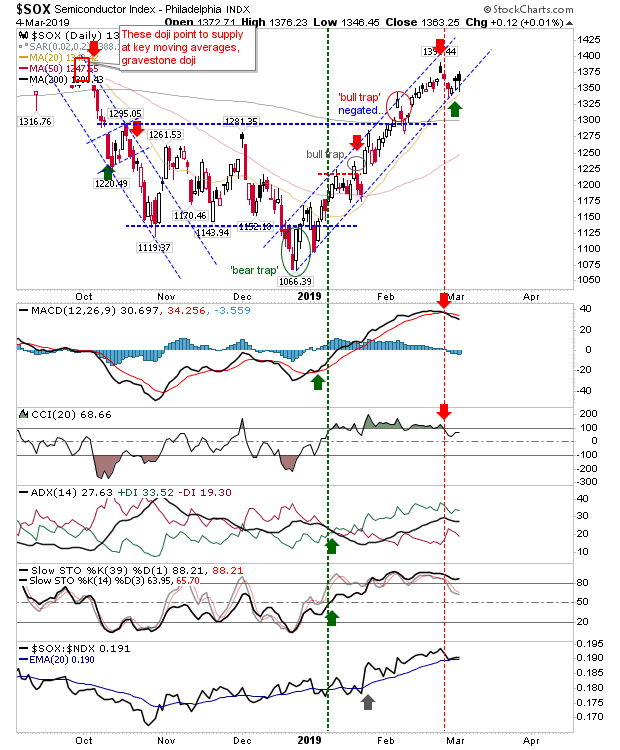 Technicals, aside from the MACD, are still bullish. The Nasdaq is also trading above the 200-day MA but unlike the S&P it did not spike below support (in this case, the 200-day MA) and relative performance remains good. The 'buy' signal holds true. Despite the weakness, the Semiconductor Index continued to hold channel support (good news for the Nasdaq and Nasdaq 100). 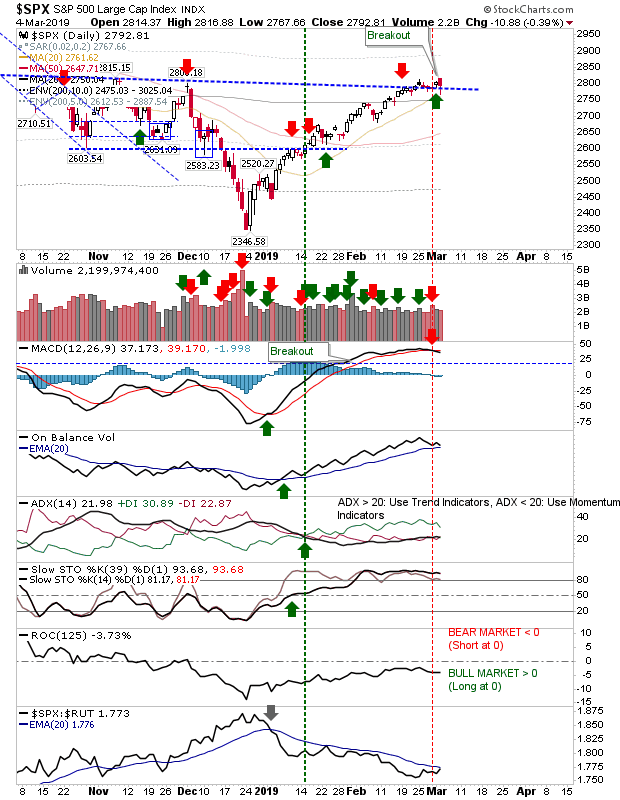 For tomorrow, it's a decision between continuing the bullish play of the S&P, Nasdaq and Semiconductor Index or doubling down on the bearish play in the Russell 2000. 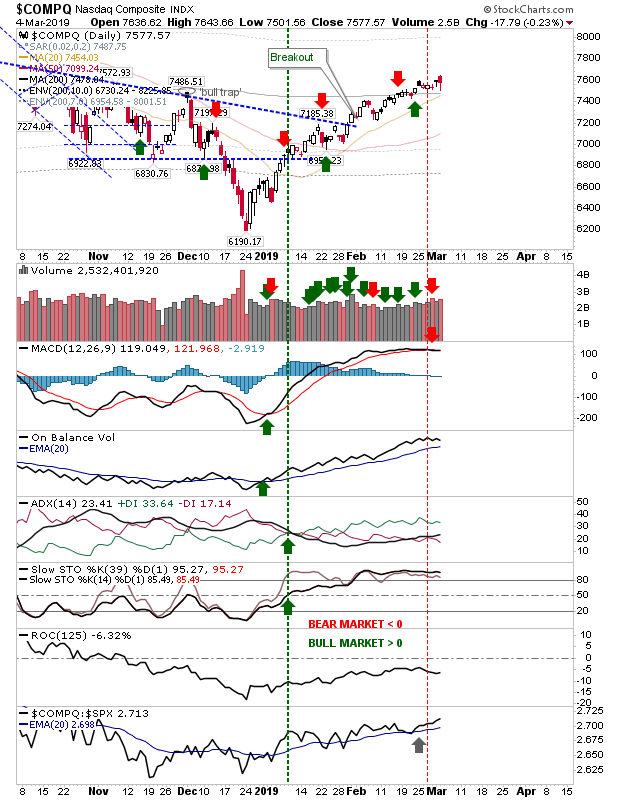 The risk: reward for either trade is low although the greatest chance of success in the near term is probably the bearish trade - simply because the December-March rally has lacked any real period of weakness. Declan Fallon is a UI/UX Dashboard Designer for First Derivatives/Kx Systems. Declan Fallon runs a market commentary blog at Markets.fallondpicks.com, and is a contributor to Talk Markets and Seeking Alpha. He previously contributed to the Motley Fool.